More than 100% Satisfaction Guaranteed! Unique "Pressure Locking" Door Design. Provides maximum safety. Very simple and easy to operate. 90 days money back warranty. Automatic shut off and automatic venting system. Temperature and pressure gauges. 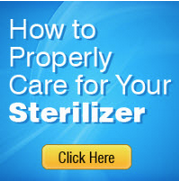 Allow you to always be in control of the status and operation of the sterilizer. Safety Valve - Prevents excessive pressure build-up in chamber. Common parts can be easily replaced. Chamber size 8 1/3" x 15"
9 7/8" x 17 1/2"